Saint Giles' Church, Cheadle UK. PORTA CAELI (the Gate of Heaven) ! These were the words uttered by John Henry Newman when he entered the Blessed Sacrament Chapel of Saint Giles' Church Cheadle (Staffordshire UK). The Cheadle Church was the creation which gave its architect - AWN Pugin - the most satisfaction. Reserving a fuller study of this glorious Gothic Revival church for another occasion, here we simply wish to comment on its Blessed Sacrament Chapel. In the first instance, it is somewhat rare - even unusual - to find a parish church from the 19th century with a special chapel for the Reservation of the Blessed Eucharist. 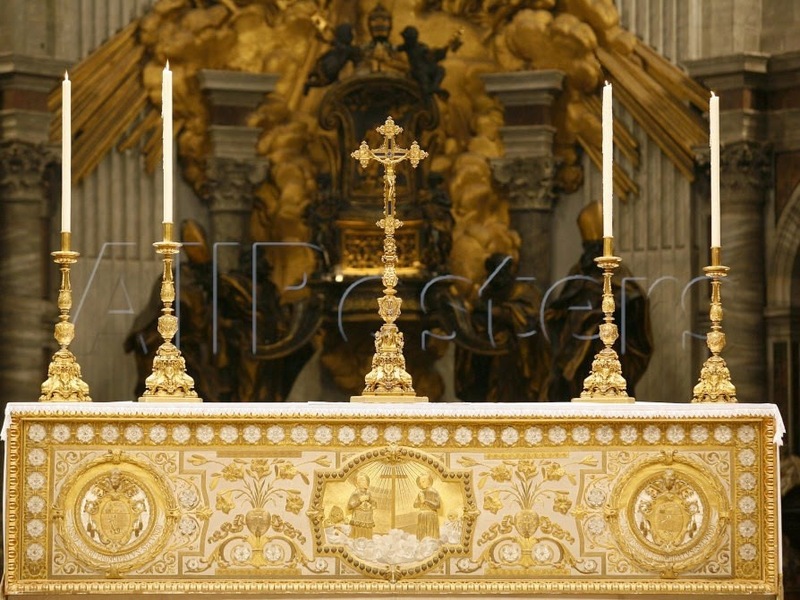 In most churches - and even many Cathedrals - the Blessed Sacrament was reserved in a tabernacle on the High altar. The former Ceremonial of Bishops did expect that a Blessed Sacrament Chapel would exist in Cathedral Churches, but even so this was widely ignored, as is illustrated by many Cathedrals in the "Old" and "New" worlds right up until the 1960's. Pugin's desire to build a church in all respects mediaeval and correct liturgically, of course, motivated his design for a distinct Blessed Sacrament Chapel at Cheadle. But how exactly he managed to convince Ecclesiastical authorities of the desirability of such a plan is unknown to this writer. The altar and tabernacle of the Blessed Sacrament Chapel. the priest may purify his fingers having distributed Holy Communion. The decorations of the Cheadle Chapel are lavish and inspire awe : precisely the effect that was intended. We find a gate leading from the southern aisle of the church into the Chapel, made of brass and figured with motifs of the Blessed Eucharist. The arch leading into the chapel is magnificently stencilled on its every face and chamfer. In these times, the Chapel is lit brightly with electrical lamps. But Pugin intended to create a mysterious corner where the Faithful may not enter and which glowed only with the light of candles and the filtered light of stained glass windows. The walls of the Chapel are all stencilled, its ceiling vaulted in stone, its floor paved with magnificent geometric tiles of terracotta red, gold and blue. The Altar of this chapel is equally beautiful, proportionate and fitting. This was not an altar on which Mass was intended to be celebrated and we note that although the Church was consecrated in September 1846, this altar was not consecrated. There is no predella or altar platform elevating the height of this altar above the pavement : a requirement for altars of the Roman Rite. No this altar was purely intended for the Reservation of the Most Holy Eucharist. The altar has no gradines or little steps upon its table, but only the Tabernacle, being a box-like form, enriched with enamelled metalwork. A retable, which is the full width of the reveals of the stained glass window above it, is formed from magnificent encaustic tiles, arranged geometrically. It is to be well noted that there are no figures of the saints or the angels in this retable. The face of this alabaster Altar, however, is beautifully enriched with five niches containing images of the Seraphim. We find the Seraphim also depicted in the three-light stained glass window above the altar. Another view of the Chapel entrance. Photograph of Father Lawrence Lew OP. 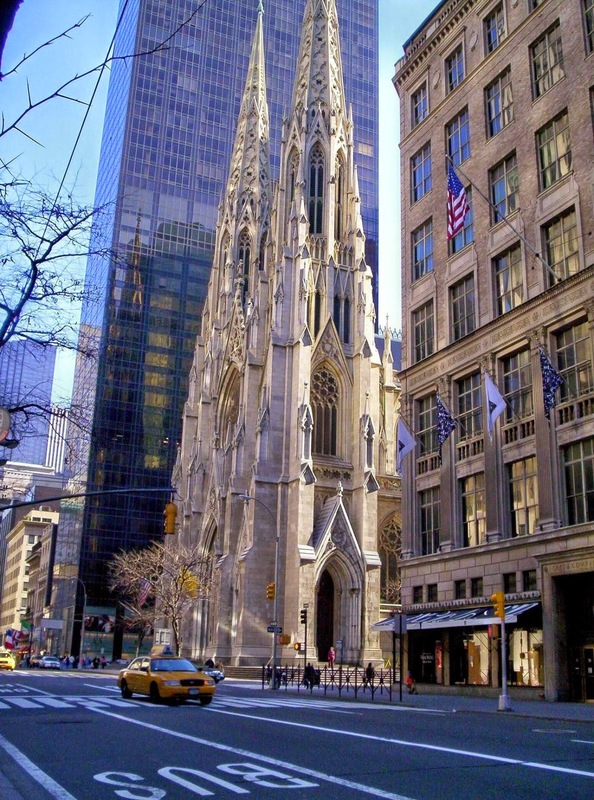 Nestled amidst the bustle of Manhattan, Saint Patrick's Cathedral. The North American continent has a wonderful richness and variety of Cathedral churches, which we hope to explore in coming months in these columns. 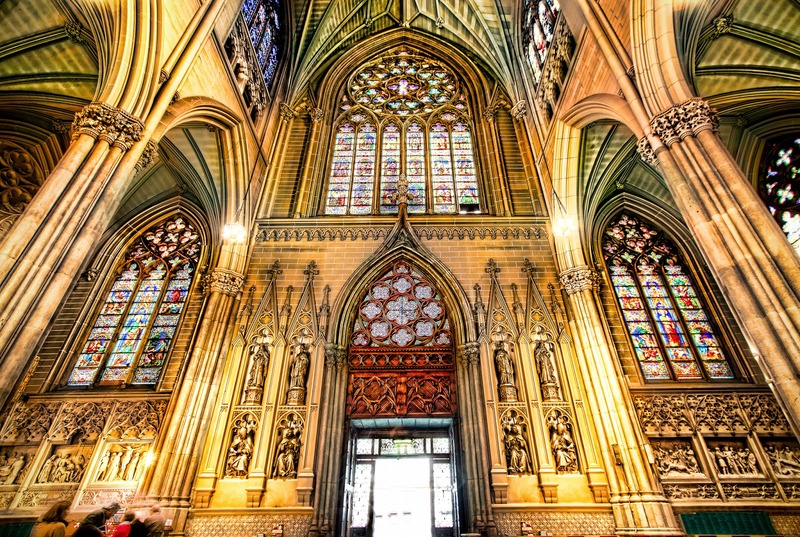 For this post, we turn our attention to (arguably) the most famous and well-loved of the Cathedrals of the United States : Saint Patrick's Cathedral in New York City. This masterpiece of the Gothic Revival was designed by the American architect James Renwick from 1853, work commencing on the building in 1858. 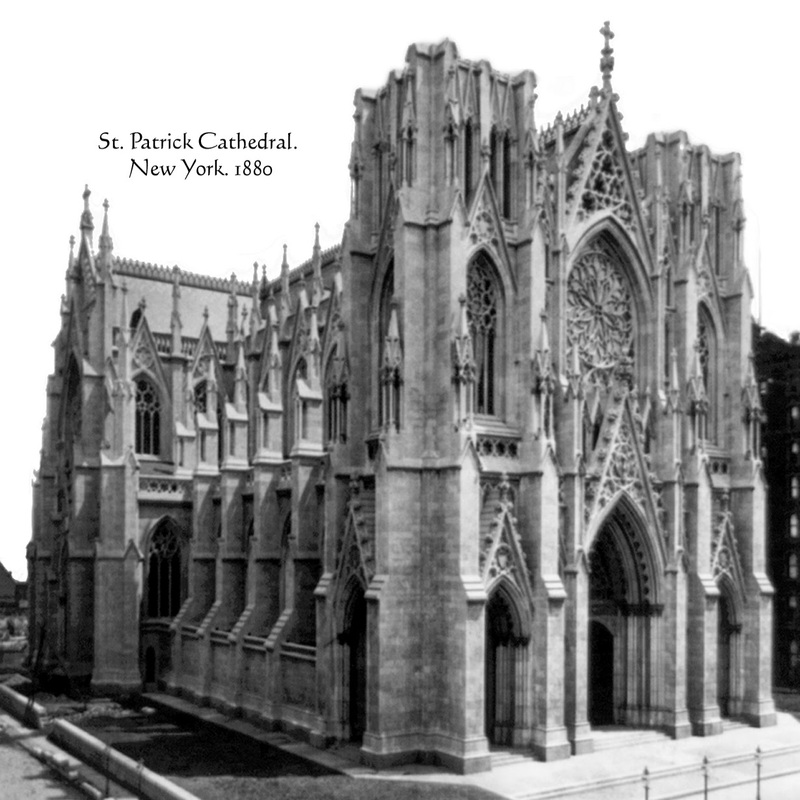 Renwick had toured Europe to inspect its great Cathedrals before commencing his designs and, as a result, Saint Patrick's has much in common in style and detail with French Cathedrals and with the great Cathedral of Cologne. 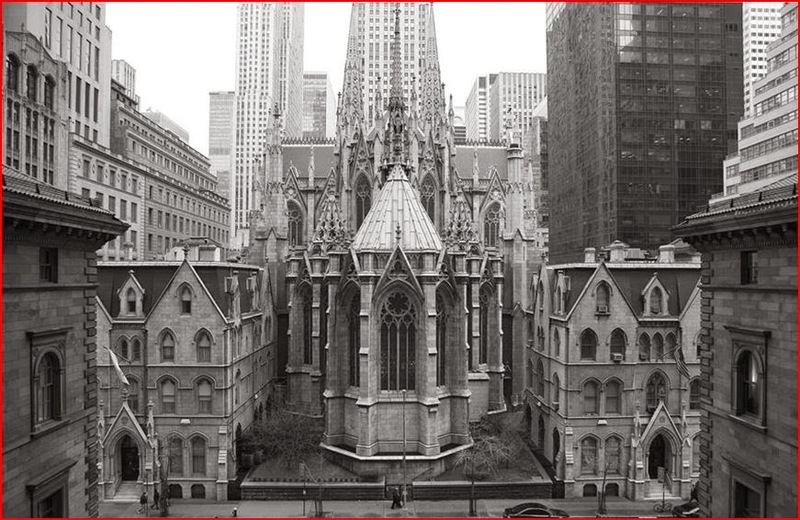 We find a certain similarity of composition in the facade of the Cathedral of Rheims and Saint Patrick's New York. 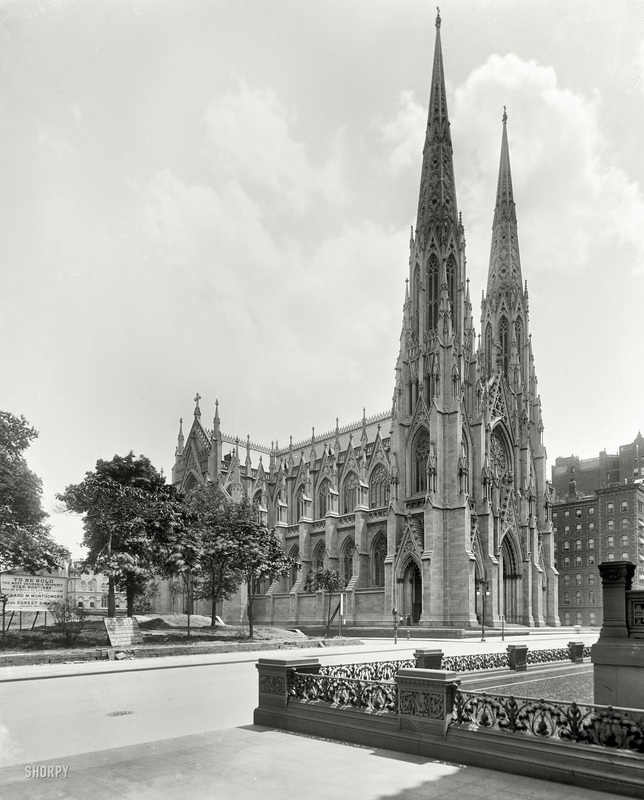 This was even more evident before the spires were completed on the New York Cathedral in 1888 (see photographs below). Saint Patrick's is not a large Cathedral by any standard, but its small size is off-set by the soaring appearance of its facade and its marvellous interior. 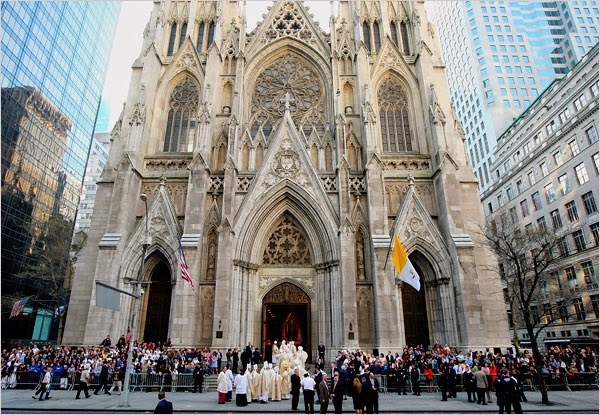 Splendidly composed facade of Saint Patrick's Cathedral. Attentuated portals are enclosed by the massive buttresses. but in a more compact form. 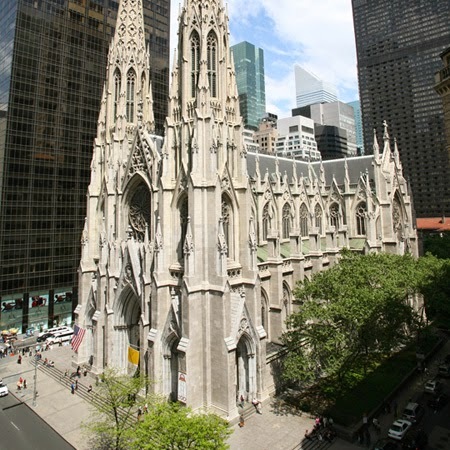 The construction of Saint Patrick's Cathedral was interrupted by the American Civil War (1861 - 1865) and in the wake of that terrible conflict, the Cathedral was not able to be completed as planned. 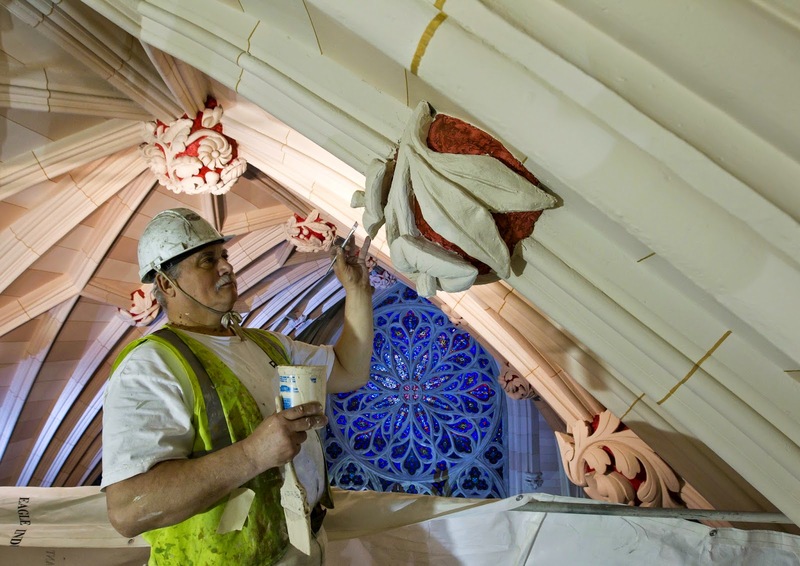 An artisan working on the nave ceiling of the Cathedral. from plaster, neatly painted to resemble masonry. The most significant change is that the ceiling, which was intended to be entirely stone vaulting, was instead made in the lath and plaster technique in imitation of stone (see adjacent photograph). Stone vaulting could not be afforded. Consequently, Renwick's design for exteriors walls supporting a stone vault with flying buttresses was modified and remains today in a curiously unfinished state. unfinished flying buttresses along the aisle walls. After the Cathedral's completion in 1888, the only addition to the building was the construction of a Lady Chapel (1900 - 1908 ) emerging from the apse. It follows in most every respect the character of the apse from which it extends. and buildings associated with the Cathedral. 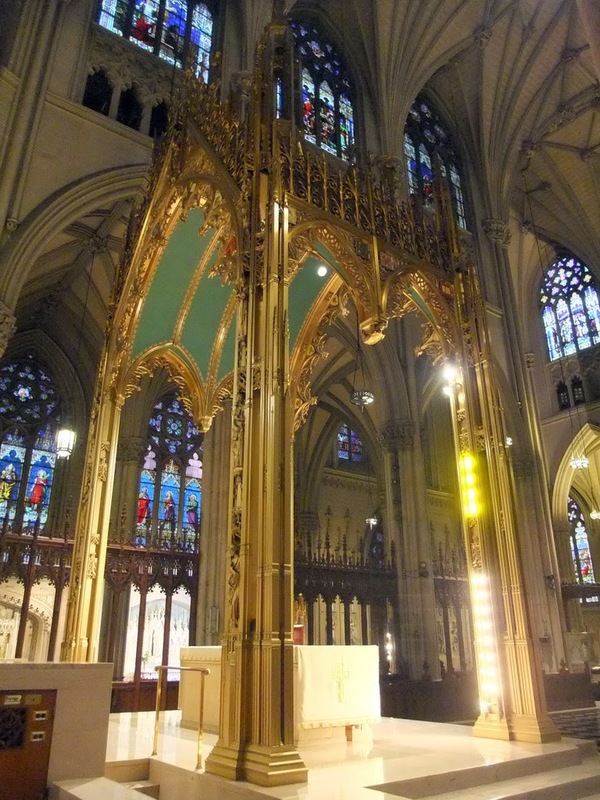 One of the consequences of the Cathedral now being surrounded with the skyscrapers of Manhattan, as could never have been foreseen in the 1850's, is that the interior is rather dark. Furthermore, successive generations have added stained glass to the clerestory windows. 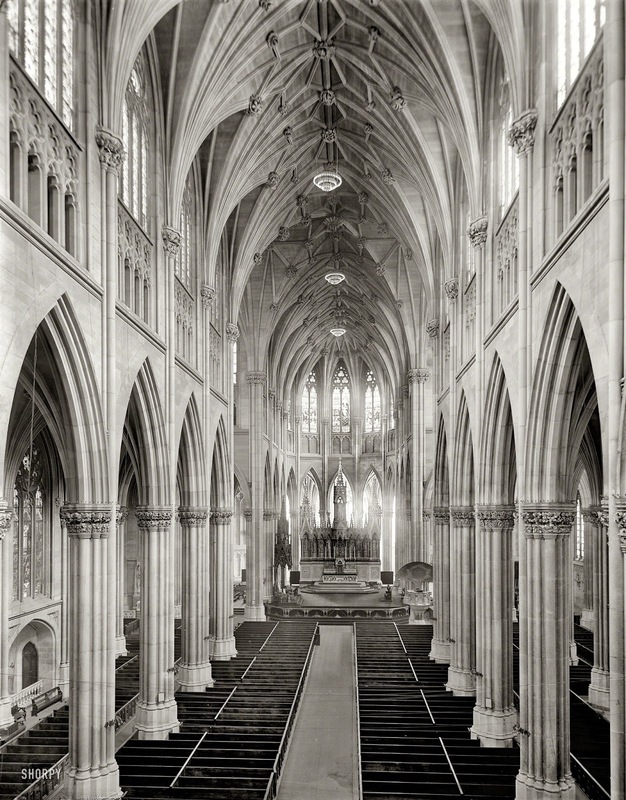 And so, we turn to a marvellous old photograph from 1907 to illustrate this Cathedral's splendid interior. are well-shewn in this photograph. This photographs shews the inventive treatment of the southern wall of the transept. Bird's eye view of the chancel. We turn now to liturgical arrangements of the Cathedral. The adjacent photograph, taken from high in the vault during recent restoration work, shews the large area of the chancel. A large area of tiled pavement separates the two sides of the choirstalls and leads to the steps of the High Altar, which rests beneath a civory or altar canopy. It will be noticed that this chancel is very spacious. Beyond the arches of the apse is an ambulatory and beyond this can be seen the Lady Chapel. The chancel is separated from the ambulatory by timber parcloses. 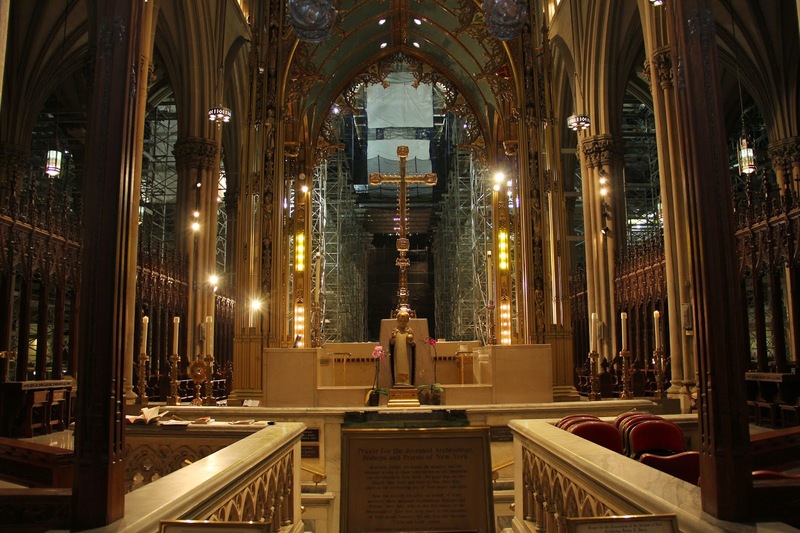 But this is not the original arrangement of the Cathedral's sanctuary. The photograph below shews something altogether different. Prior to 1942, the High altar was a composition in the High Victorian style. It gleamed white and because it was very lofty and communicated most of the width of the chancel, was a real focal point for the Cathedral. 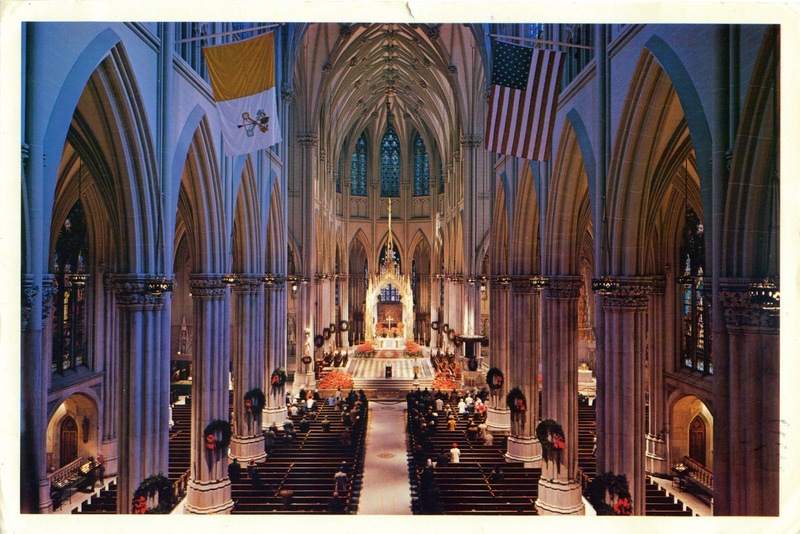 Although from the perspective of liturgical ideals crowning the High altar with a civory is usually desirable and admirable, in the instance of Saint Patrick's Cathedral, the change was not successful visually. The civory - a composition in a free Gothic style - was purposely left very open, so that it would be possible to see through it to the apse beyond. The design of this civory is not sufficiently three-dimensional for it to have an adequate visual impact in this large space. 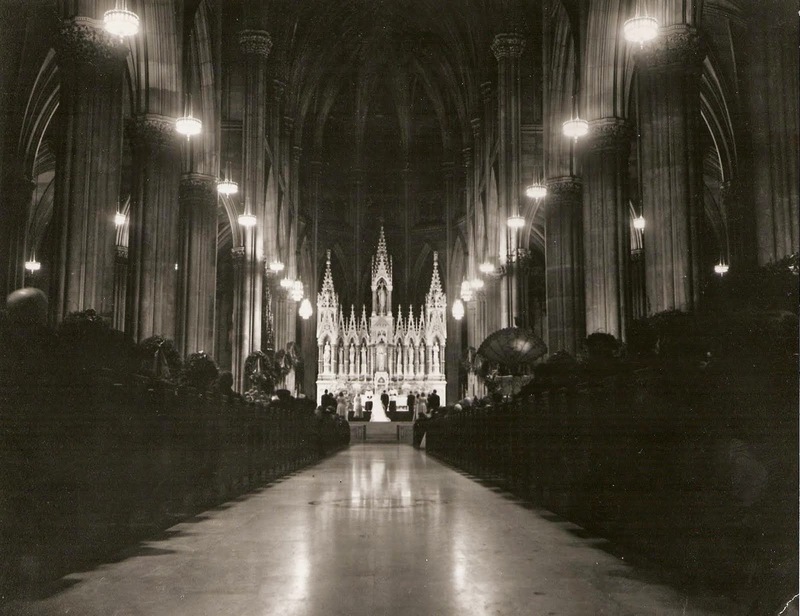 Photograph taken during a wedding in the Cathedral in the 1930's. The old High altar visually dominates, drawing all eyes towards it. The Cathedral photographed in the 1960's. An early photograph of the 1942 High altar and civory. A dossal was suspended behind the altar to assist focus. Another view of the civory. shews the entrance to the Cathedral Crypt. A beautiful view of the Cathedral taken at the beginning of the 20th century. 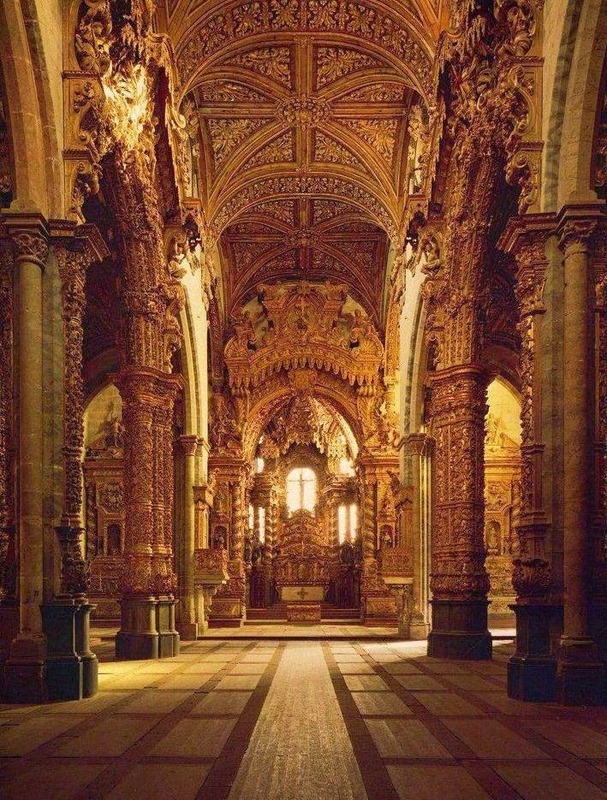 The Church of Saint Francis in the City of Porto, Portugal is a cruciform Gothic building, commenced in the late 14th century and completed in about 50 years. In the early 18th century its noble interior began to be incredibly enriched with gilded timberwork in the Baroque style. The distinctive fusion of Gothic and Baroque is shewn in the above photograph of the nave, looking towards the High altar. Church of S' John the Evangelist, Ballinasloe (1840). Before that period of architecture began in England and on the Continent known as The Gothic Revival, architects had been dabbling for almost a century in "Gothic" for domestic, civil and ecclesiastical buildings. Buildings of this type generally are described by the term Gothick, which has become a sort of perjorative. These buildings generally lacked the sophisticated expression of form and decoration of Gothic Revival buildings and sometimes their proportions were not all they might be. Nevertheless, accepted as they are, there is much to admire. 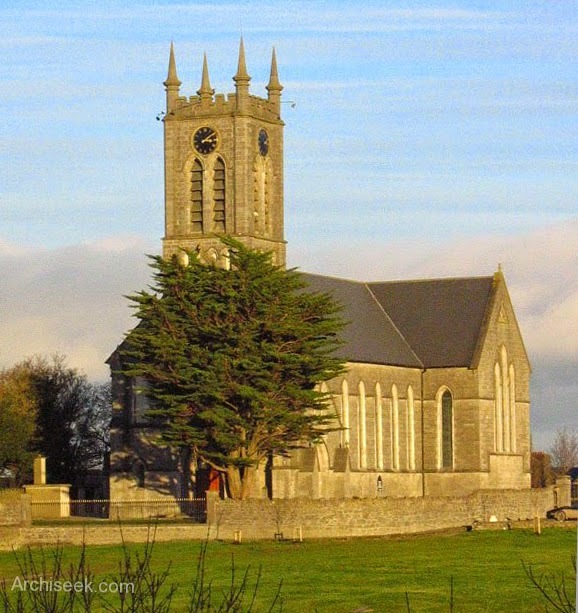 This post concerns a Church of Ireland (part of the Anglican Communion) church in the town of Ballinasloe in County Galway, Ireland, dedicated to Saint John the Evangelist. This church was built in the year 1840 at the very end of the Gothick period and designed by the architect Joseph Welland. Saint John the Evangelist is a modest stone building of good proportions with a tower rising slightly behind (rather than projecting from) its western facade. All the details are very simple, although lacking the finesse of mediaeval churches of the Early English period. Western facade of the Ballinasloe Church. Perhaps the most obvious tell-tale that this is Gothick is the cruciform design, which was typical of churches of this period. Mediaeval English churches (at least of those in the Gothic period as distinct from the earlier Norman and Saxon periods) were not cruciform in this manner. More likely, they had an aisle, or two aisles abutting the nave, beyond which transepts might extend. But hardly ever is to be found a pair of transepts projecting from a one-room mediaeval nave. Such a form of church became more common after the Reformation in England, when "Gothic" came less and less to be used for church building as Catholic worship was rejected. Building anew in the Gothic style is now a difficult matter. It is expensive and architects who understand the "grammar" of Gothic are somewhat rare. Perhaps the pared-back style of the Gothick period might be considered anew? A building which is done simply and well is much to be preferred to something very elaborate which fails miserably. 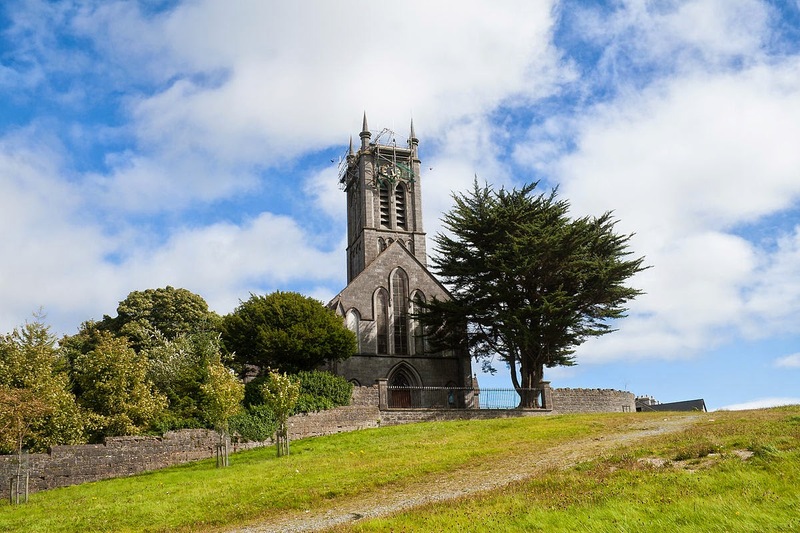 Interestingly, the Catholic parish of Ballinasloe has a later church design by AWN Pugin himself and what a fine building it is! To be discussed in another post. Where is the altar ? What is illustrated in the adjacent photograph? Here we have the sanctuary of a modern Catholic church, place unknown. 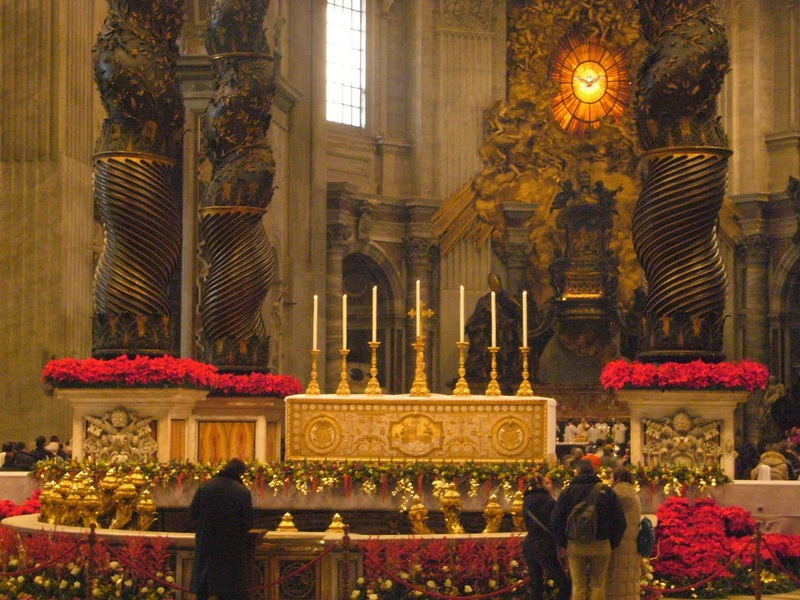 Christmas is being celebrated and the Crib is placed on the altar steps with two huge display of flowers behind it. But where is the Altar? 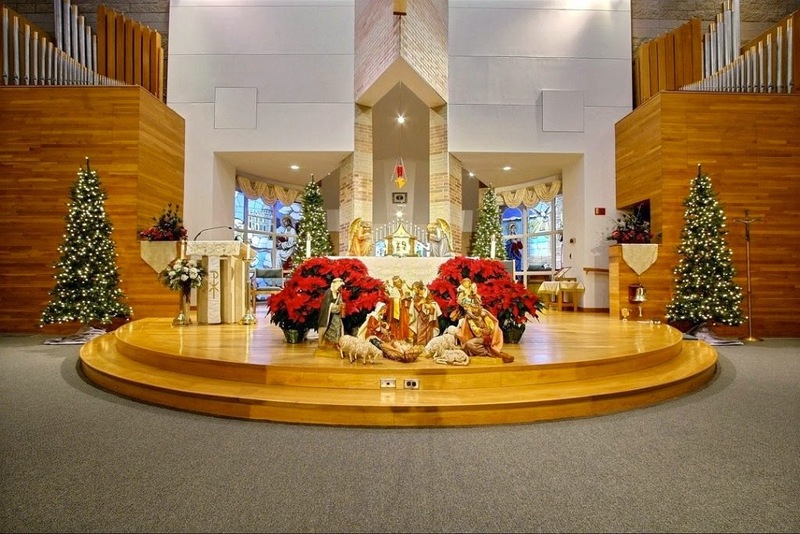 The desire to assist the devotion of the Faithful to the Christ-child has obscured the real focus of this church in whatever Liturgical Season : the Altar. Instead we have the Altar being used as a sort of backdrop for a devotional tableaux. The flower arrangements are so massive that the Altar largely disappears from view. 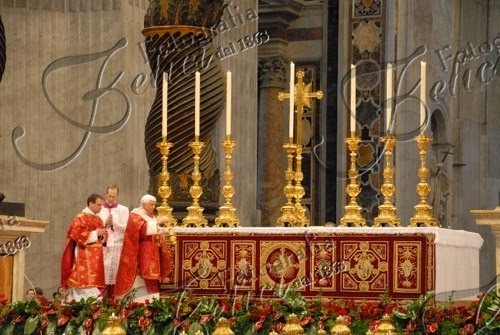 Pope Benedict is seen here offering Mass on Pentecost 2008.
frequently clothes this altar for Papal Masses. As the early linen clothing of the altar recalled our Lord’s burial shroud, so the precious fabric of the later frontal is to recall his royalty....The clothed altar with its beauty and changing colours is a symbol of the Mystical Body - the whole Christ, Christ united with all his saints - it translates this doctrine into the language of colour and form. In addition to its symbolical value, the frontal - with its sequence of colours and its changing form and decoration - lends variety and new beauty to the altar, and helps to mark the degrees of festivity in the Church’s liturgy. Because of its function as an adornment of the altar - although not its primary purpose, which is its symbolism - some liturgical writers maintain that its use is not obligatory, by custom, if the altar is itself made of precious material and highly decorative. But if the frontal is not used, not only is its symbolism disregarded, but the altar is without change of permanent adornment, degrees of festivity cannot be adequately expressed, nor can the liturgical changes of season or feast be fully indicated. J.B. O’Connell, Church Building and Furnishing: the Church’s Way, pp.188-89. The use of the antependium has been a continual practice in the basilicas of Rome. is clothed with an antependium during the Papal Masses. Shewn in this image is one of the elaborately-worked antependia used in Saint Peter's. It may also be observed that many altars of no particular artistic merit, and especially altars which are simply supported on two or four pillars and lack a solid panel underneath the altar table, can be particularly enhanced by the use of an antependium. 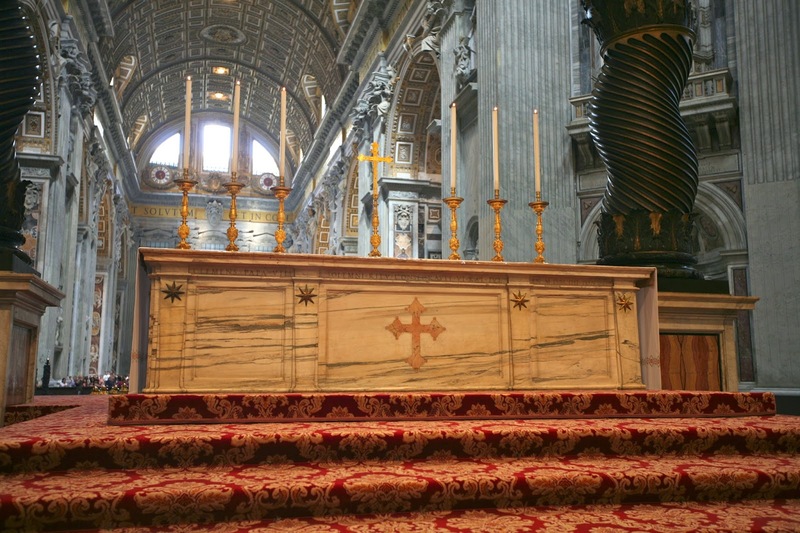 The altar in Saint Peter's without an antependium. would always be clothed for Mass. The use of the frontal as the vestment of the altar remains proper and entirely suitable...it is still very desirable as a worthy vestment for the altar...and as an effective indication of the liturgical celebration. F.R. McManus, Handbook For the New Rubrics, Baltimore, 1961, pp. 202-03. Sufficient has been quoted to demonstrate that even if the antependium is not required, its use is eminently suitable and desirable liturgically, important symbolically, and could not be recommended strongly enough. Very few altars are incapable of having antependia attached to them, even if some ingenuity in keeping them in place is required. A wider view of the Altar of the Confession, decorated for Christmas. The altar is manifestly enhanced by the magnificent antependium. In 1812 was born one of the most important figures in the history of architecture and the decorative arts: Augustus Welby Northmore Pugin. 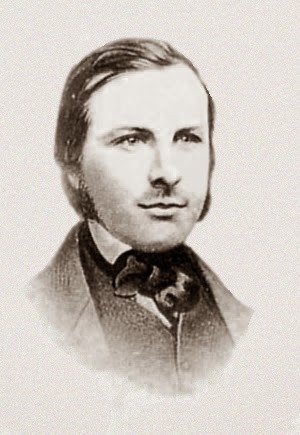 The son of the French émigré Augustus Charles Pugin (who himself was an architectural draughtsman and topographical watercolourist), AWN Pugin is arguably the greatest British architect, designer and writer of the nineteenth century. Pugin was responsible for an enormous quantity of buildings, and also for countless beautiful designs for tiles, sacred vestments and paraments, metalwork, furniture, wallpaper, stained glass and ceramics. Some of his best known work includes the magnificent interiors of the Houses of Parliament, the church of St Giles, Cheadle, in Staffordshire, and his own house, The Grange, in Ramsgate (Kent), together with the nearby church of Saint Augustine, which he built and paid for himself and where he is buried. Through his buildings, designs, and particularly his forceful and witty writings, such as Contrasts (1836) and the True Principles of Pointed or Christian Architecture (1841), he made people think in a new way about what architecture was. Pugin taught that only a caring and "good" society can raise buildings that are truly honest and beautiful. 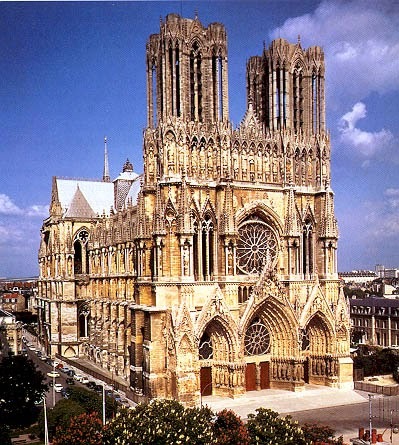 For him, Gothic architecture was the greatest style of building, and therefore the Middle Ages, the period in which these buildings were conceived, must be the closest man can get to a perfect society. Pugin's beliefs and ideas have implications beyond his own immediate preferences, and so for many reasons he was, and is, therefore, hugely influential, both on other architects and designers of the Gothic Revival throughout the Victorian era and also on many subsequent architects, theorists and writers. The above paragraphs were adapted from the website of The Pugin Society. There are so many architectural and liturgical jewels which Pugin created in his short life, but in this post we wish to discuss a detail to reveal the layers of Pugin's creativity, rather than give an overview of his achievements. 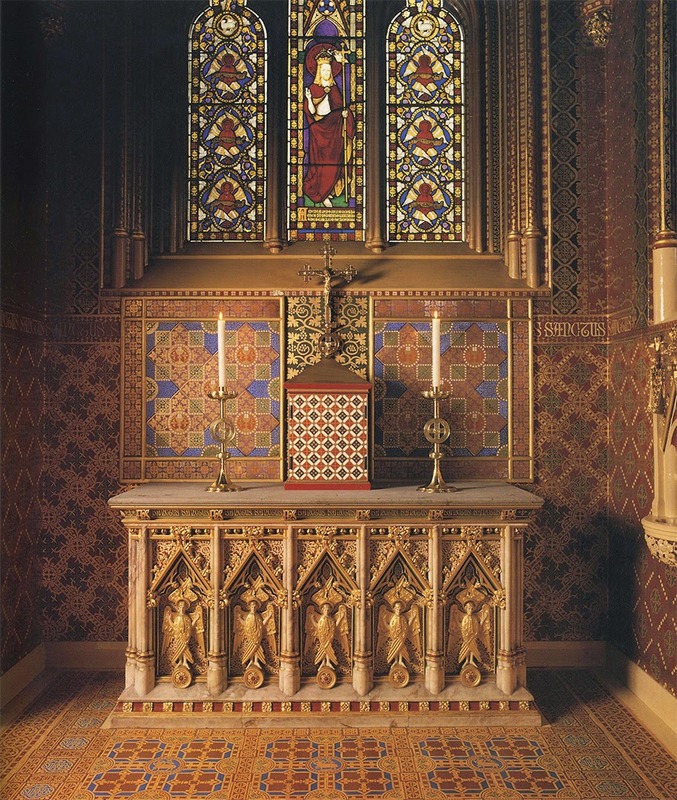 We look at the photograph included above of a shrine in the Chapel of Saint Edmund's College, Ware, one of the last buildings designed by Pugin and completed in 1853, after his death. This is a shrine to the patron of the College, Saint Edmund. An elaborate reliquary is the centrepiece of the shrine, situated in a reredos above the altar. Most obviously, this shrine is decorated in a beautiful and tasteful manner. 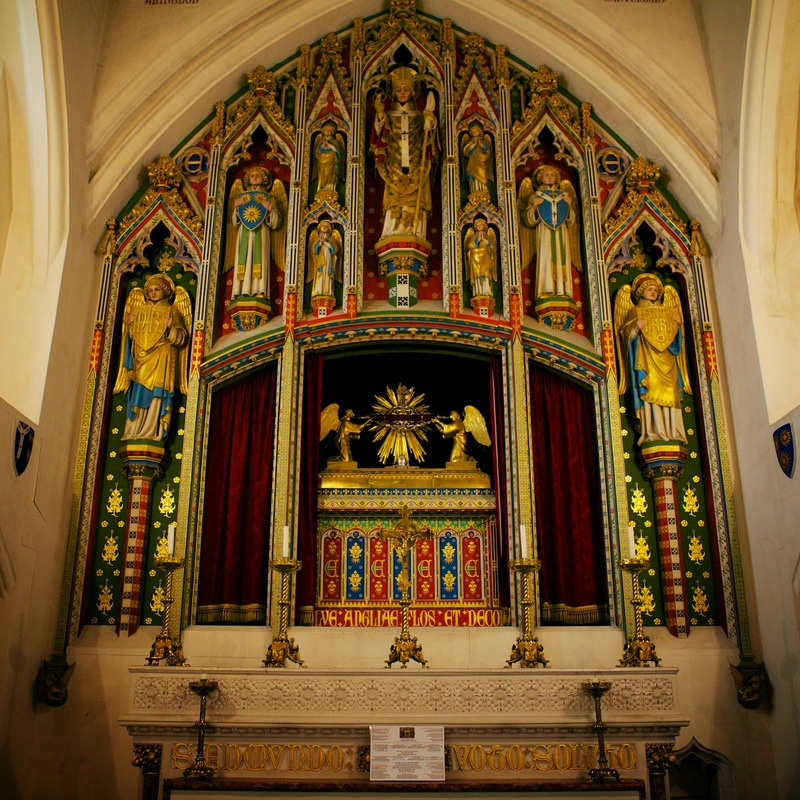 The stonework of the reredos is enhanced with polychrome work and gilding, down to the finest detail. In several places, in the script Pugin favoured, is the letter " E " for Saint Edmund and around the base of the reliquary, with its alternating panels of blue and red, Saint Edmund is honoured with the words : Hail, flower and comeliness of England. The angels, which adorn eight of the nine carved recesses are all treated differently and have so much more vigour that the statues of the baroque (we will pass over without mention the genre of plaster statue). But the shrine is also a study in ingenuity. In a shallow alcove, set-off from the main part of the chapel, the reredos sits into a large arch : it does not protrude from the wall. It might be a window behind that, but, of course it isn't. 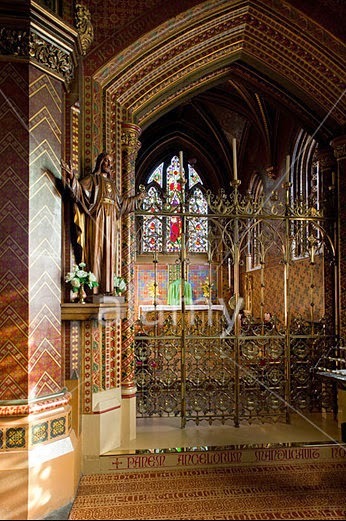 Pugin has skilfully used different forms of arch to create a reredos in this space, giving the impression that it was an afterthought, but an ingenious one, filling a blank area in the chapel. A further master touch was the use of curtaining of rich dark red velvet in the central recesses of the reredos. It gives the impression of the curtained stage of a theatre. The arches here are distinctly different and free of the structural ornament which the other arches have; their shallow slope becomes the foundation from which further archwork springs. But their form, together with the curtains, also gives the impression of a substantial space behind the shrine, although in fact there is none at all. The curtains, of course, may be drawn across the Reliquary, if desired, during the celebration of Mass or during Passiontide. 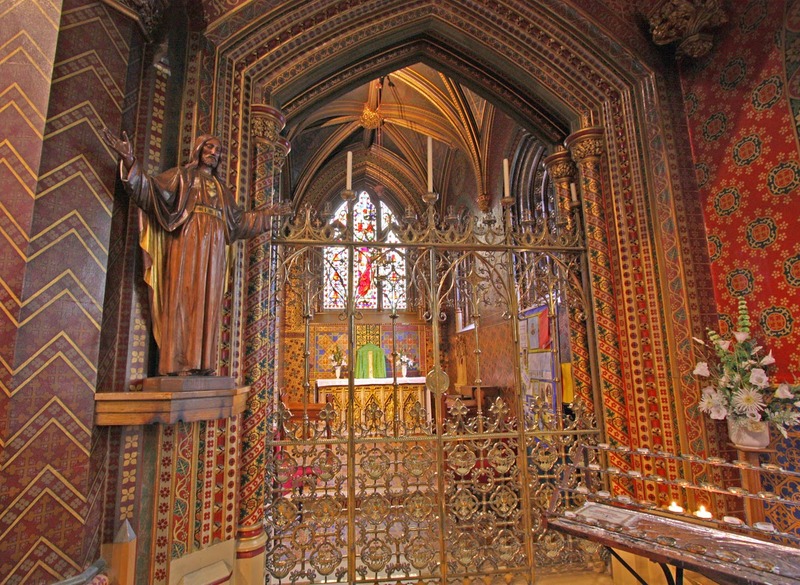 This Shrine is a small example of the many wonders which flowed from the creative mind of AWN Pugin. The Church of the Multiplication, Tabgha. is believed to have been performed. 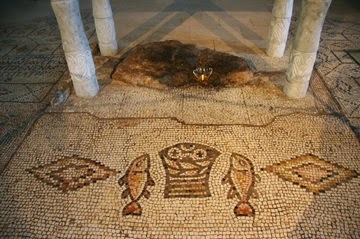 Surrounding it are 5th century mosaics from the original church. 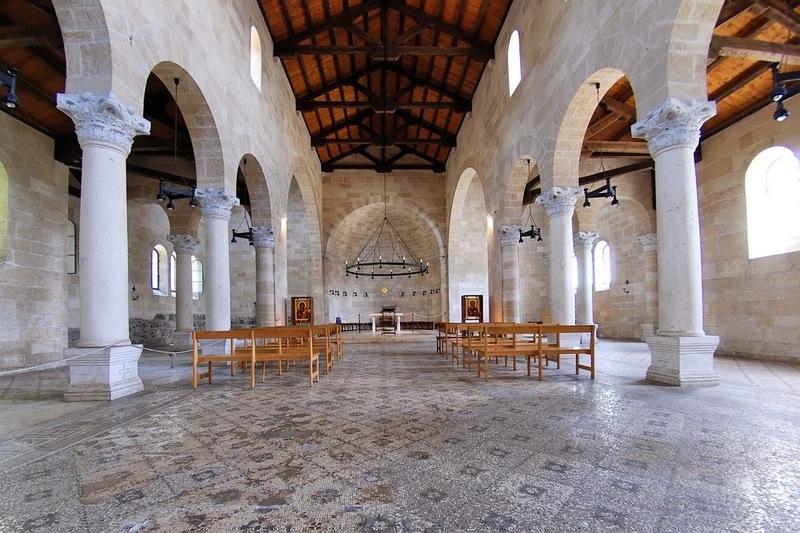 Although the location is not specified for Christ's miracle of the Multiplication of the Loaves and Fishes, tradition attributes it to the town of Tabgha on the northwest shore of the Sea of Galilee. A church on this site was built in the middle of the fourth century and was enlarged around the year 480. But this ancient church was destroyed towards the end of the seventh century. Remarkably, a reconstruction of the old church was completed in 1982! And it is this church which is the subject of this post. This church is also in the basilican style - but is quite different from the Church of the Nativity, which was the subject of our previous post. Here we find a building which is more Romanesque than Classical Roman. Interior of the Church of the Multiplication of the Loaves and Fishes. was built in the late 20th century. The church is strikingly unadorned, but has a serene and noble character. 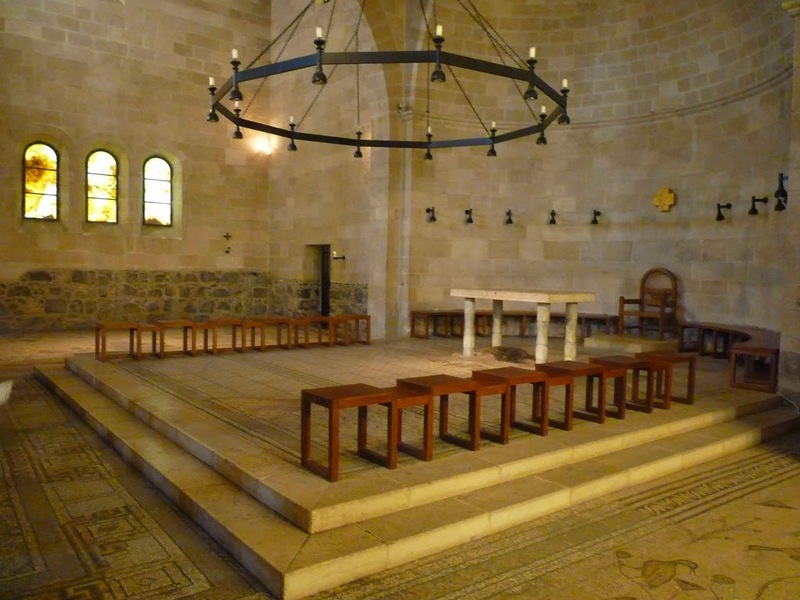 The unadorned simplicity of this church is most beautiful, but it has a serious deficiency. Looking at the photographs, one thing is immediately obvious : there is insufficient focus to this church. The focal point for any church ought to be, of course, the High altar. Although the presbyterium here is elevated above the nave and transept floors, the altar is not as visible as it ought to be. Altar and floor and wall are all of much the some monochromatic colours. Curiously, the corona of lights and candles is not above the altar, but that area in front of it. In the transept can be seen part of the surviving stone wall of the ancient church. 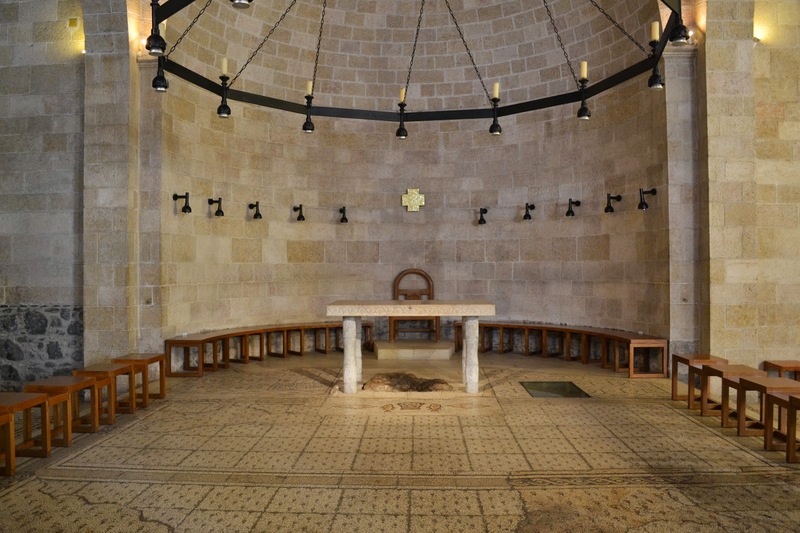 Since the altar itself is built over that hallowed spot where Christ's Miracle is believed to have taken place (the stone visible beneath the altar), covering the altar with a frontal may not be an appropriate measure to give the altar more prominence. An altar resting merely on four columns was constructed so that the spot would be easily visible. and the stone beneath the altar. not least so because of the absence of decoration in the apse. The whole matter would be readily resolved were a ciborium or canopy built over the altar. Instead of looking towards a blank wall, a ciborium would become the focal point and lend added dignity both to the altar and to the site of the Miracle. Perhaps a future generation will add that ciborium.